In 1994, the Zapatistas took up arms claiming for indigenous people rights in Chiapas, Mexico. After 12 days of civil war, the government called for dialogue. Nevertheless, since then, it has deployed a “low intensity war”. Simultaneously, the Zapatistas started to establish a new set of institutions, which have allegedly enhanced their socio-economic situation. The purpose of this study is to provide empirical evidence about the impact of the Zapatista conflict on the wellbeing of the communities under harassment. The results of this study suggest beneficial effects of the Zapatista conflict on fertility rates, which are presumably channeled by the Zapatista health system. JEL code: O12, I21, I32, J13, O54. Key words: Conflict; War; Zapatistas; Institutions; Indigenous; Mexico. En el año 1994, los Zapatistas se levantaron en armas, bajo el reclamo de mayores derechos para la población indígena de Chiapas, México. Luego de 12 días de guerra civil, el gobierno llamó al diálogo. Sin embargo, desde ese momento, impulsó una “guerra de baja intensidad”. Al mismo tiempo, los Zapatistas comenzaron a establecer un conjunto de instituciones, que presuntamente han mejorado su situación socio-económica. El objetivo de este estudio es proveer evidencia empírica acerca del impacto del conflicto zapatista sobre el bienestar de sus comunidades. Los resultados sugieren efectos beneficiosos sobre la tasa de fertilidad, presuntamente canalizados a través del Sistema de Salud Zapatista. Palabras clave: Conflicto, guerra, Zapatista, Instituciones, Indígenas, México. I am especially indebted to Jean-Louis Arcand for his invaluable comments and support. I gratefully acknowledge the helpful comments of Alejandro López-Feldman, Martina Viarengo, Gustavo Castro, Onésimo Hidalgo Dominguez, Bruno Baronnet, Rubén Muñoz, Diana Reartes, Héctor Javier Sánchez-Pérez, Dany Jaimovich, Dmitriy Skugarevskiy, Cecilia Heuser, Dante Sánchez Torres, and two anonymous referees. I am also grateful to the seminar participants at the Colegio de la Frontera Sur (ECOSUR) and at the Development Therapy sessions of The Graduate Institute of International and Development Studies. I thank the Swiss Confederation (Grant number: 2011.0075) and the Graduate Institute for financial support. On January 1, 1994, an uprising of indigenous communities interrupted New Year’s Eve festivities in Chiapas, Mexico. The Ejército Zapatista de la Liberación Nacional (hereafter EZLN) went up in arms claiming for indigenous people rights. After 12 days of civil war, the federal government called for dialogue. Although the official civil war lasted less than two weeks, a “low intensity war” (LIW) started through military and paramilitary harassment against the Zapatistas with the consequence of dwelling damages, massacres, and thousands of Internally Displaced People (henceforth IDPs) (PNUD et al. 2012). In 2000, when the Partido de Acción Nacional reached the presidency, conflict intensity began to decrease. The purpose of this study is to quantify the long-term effect of this conflict on different measures of wellbeing. From the fields of Anthropology and Political Science, there are several studies analyzing the origin and organization of the Zapatista Autonomous Communities (hereafter ZACs) and the overall connotation of their autonomy. However, the quantitative impact of the “Zapatista Conflict” has been widely overlooked. This investigation is located in the body of literature related to conflict, with Miguel and Roland (2011) and Miguel, Satyanath and Sergenti (2004) as the leading proponents. Some empirical evidence of the detrimental (Akbulut-Yuksel, 2009; Shemyakina, 2011; Akresh et al., 2011; Swee, 2009) or neutral (Miguel and Roland, 2011) long-term effects of conflict on economic development has been found. However, there is no single paper evaluating the impact of conflict when the communities under harassment were establishing, at the same time, their institutions and development policies. This research analyzes the consequences of this conflict (which had its peak during the period 1994-2000) on several well-being measures. It combines variables from the Mexican Census with a unique documentation of the conflict at the locality level from an independent, non-profit and non-partisan entity established in Chiapas, called CIEPAC (Centro de Investigaciones Económicas y Políticas de Acción Comuntaria). In particular, this institution published the military and police positions established in Chiapas since 1993. 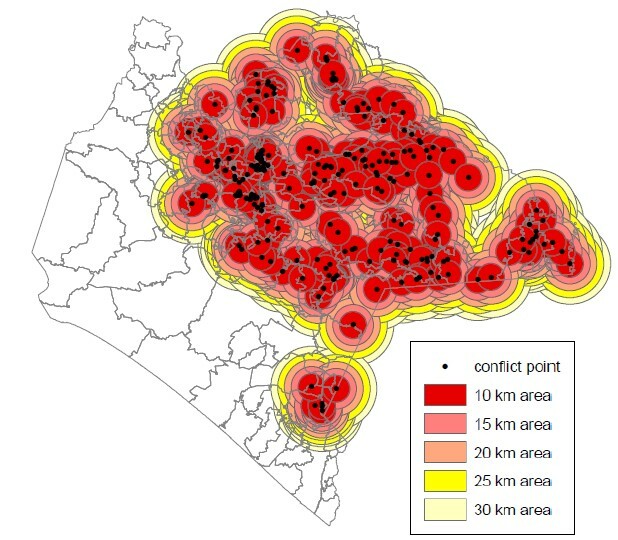 Using geo-referenced data from INEGI (the Mexican Institute of Statistics), this paper, first, sets an influence area from each position at the locality level to identify the communities in conflict and, then, it obtains the number of years that the locality is exposed to conflict. The conflict variable is instrumented by the distance in kilometers from each locality to a strategic military triangle set by the EZLN for its uprising in January 1994 at the doorsteps of the Lacandon Jungle, a natural boundary that allows the Zapatistas to hide from the National Army. The expected impact of the conflict may not be necessarily negative, as one could readily assume. On the one hand, according to the literature in conflict, its effects would be negative (or neutral in the best-case scenario) because of dwelling damages, teacher’s absence, psychological disruptions, malnutrition, and famine, among other reasons. On the other hand, there is a particular feature playing at the same time in a large amount of communities in conflict: the new institutional arrangement adopted by the Zapatistas, echoed by their own education and health system, laws, and the so-called Juntas de Buen Gobierno (JBGs, or Good Government Councils). These institutions may have enhanced the wellbeing conditions in the ZACs. In fact, in the 2005 Zapatista Press Release, the Sexta Declaración de la Selva Lacandona, the Zapatistas declared that “only the indigenous communities located in the Zapatista territory have enhanced their life conditions, as regards health, education, food, and housing” (EZLN, 2005:5). Hence, as several communities in conflict are ZACs, the allegedly negative effect of the conflict may be counterbalanced. The empirical findings of this paper suggest that the conflict is associated with a decline in fertility rates and in school absenteeism, and with an increase in literacy rates. There are some plausible explanations behind the “hidden benefits” of the conflict. One of them consists in the potential beneficial effects coming from the Zapatista institutions, considering that the conflict is geographically overlapped with ZACs location, and that there is some evidence stating the beneficial effects of the Zapatista institutions (Gutierrez, 2005; Cerda García, 2011; Shenker, 2011; Barmeyer, 2009). In order to test this argument, the conflict intensity measure is interacted with a dummy variable indicating if there is Zapatista presence in the municipality. The effect of this interacted variable is only significant on fertility rates, thus presumably capturing the effect of the Zapatista health system; i.e. an additional year in conflict in a municipality with Zapatista presence is associated with a 3.56 percent decline in fertility rates. There are two main contributions of this paper. This is the first attempt to robustly analyze the quantitative effect of the Zapatista conflict. At the same time, it adds to the literature of conflict with a particular case where bottom-up policies are implemented in the region in conflict. The remainder of this paper is organised as follows. Section II presents the literature review. Section III describes the conflict per se and the Zapatista institutions. Section IV explains the identification strategy, the instrumental variable, and the conflict intensity measure. Section V presents the data. Section VI contains the results, while some hypothesis about them are presented in Section VII. Finally, Section VIII presents the final remarks. The numerous negative consequences of armed conflict are undeniable (e.g. life losses, displacements, massive killings, capital and infrastructure destruction, malnutrition, human and civil rights impediments, and psychological effects). But, does conflict have a long lasting effect on economic growth and development? And if so, under which circumstances? This is an essential question addressed in the economic development literature in the last few years. Miguel and Roland (2011) evaluate the long-term impact of the Vietnam War on poverty rates, consumption expenditures, infrastructure, and human capital, without finding statistically significant effects. A special contribution of this paper is their acknowledgement of both the non-random placement of the areas under disruption and the endogeneity in the conflict variable, and thus, they propose to use the distance from the 17th parallel as an IV for U.S. bombing intensity. The aforementioned paper and Miguel et al. (2004) represent the core of a more robust literature on the topic, which considers the potential double causality between conflict and economic development. In particular, Miguel et al. (2004) conclude that a reduction in 5 percentage-points in annual economic growth increases the average likelihood of civil conflict by 50 percent. Given the difficulty in establishing valid exogenous instrumental variables, several papers have attempted to circumvent this problem using cohorts, comparing those exposed and non-exposed to the conflict -as popularised by Rosenzweig and Wolpin (1986, 1988) and Duflo (2001). Under this framework, Shemyakina (2011) suggests that civil conflict reduced the probability of completing schooling for girls (but not for boys) in between 7 and 12.3 percent. 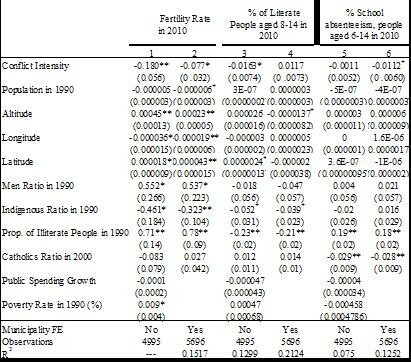 Akbulut-Yuksel (2009) examines the effect of physical destruction in German cities after World War II and finds that children in conflict had 0.4 fewer years of schooling on average in adulthood, half an inch (one centimeter) shorter, inferior self-reported health satisfaction, and 6 percent less earnings. Several other studies suggest negative effects of conflict. Akresh et al. (2011) find long-run deleterious effects of the 1967-70 Nigerian civil war on women’s human health capital. Akresh, Luchetti and Thirumurthy (2012) find a short-run negative impact on height-for-age Z-scores from the 1998-2000 Eritrea war. Akresh, Bundervoet and Verwimp (2009) analyze the impact of the 1994-1998 Burundi conflict, suggesting that an additional month of civil war exposure decreases a child’s height-for-age Z-score by 0.047 standard deviations. Similarly, León (2012) finds a significant short- and long-term negative impact on years of schooling of the 1980-1993 Peruvian conflict between Sendero Luminoso and the National Army. Swee (2009) examines the influence of the Bosnia and Herzegovina civil war in 1992-1995 on education. Her results imply that conflict reduces the likelihood of completing secondary school. Finally, Arcand and Wouabe (2009) analyze the effect of the Angolan civil war, instrumenting conflict by the distance of each community from the main rebel group’s headquarters. In the short-term, they find that conflict decreases child health and fertility, increases school enrolment, and does not statistically affect household expenditures. In the long run, they find that this conflict does only have a statistically but marginal effect on child health, while no impact on the other variables. These results on fertility rates are consistent with the idea that conflict only affects short-term family planning decisions -as suggested by Agadjanian and Prata (2002), De Walque (2006), Lindstrom and Berhanu (1999), and Schindler and Brück (2011). In sum, there are several empirical studies showing both the (generally) detrimental effects of conflict on wellbeing measures and the neutral impact on fertility rates in the long run. Nevertheless, there is no single paper analyzing the consequences of conflict when the communities under civil strife are devising, at the same time, their inner institutions and development policies. This is the topic of this paper. On January 1, 1994, the EZLN took over seven municipal heads in Chiapas, including San Cristóbal de las Casas, the third one in terms of population. Simultaneously, the EZLN issued the “First Declaration of the Lacandon Jungle”, a war pronouncement against the federal government with the purpose of “liberating the oppressed Mexicans” of Chiapas and spread the movement to the national level (EZLN, 1993). Twelve days later, after the National Army recovered the seven municipal heads and with the result of between 145 and 1,000 fatalities (according to Servicio Internacional para la Paz), the federal government unilaterally declared a cease-fire. In 1995, the Army launched a fierce offensive against the Zapatistas and occupied several communities, while in February 1996, in order to enhance its public reputation, the government signed the San Andrés Accords, granting recognition to indigenous rights. However, these accords were not respected and the Zapatistas left the dialogue (CIEPAC, 2003). The conflict reached its zenith with the Acteal Massacre in 1997, where approximately 60 paramilitary agents took over a church with displaced people and killed 45 of them (Hidalgo Dominguez, 2006). Although the official war lasted only the first few days in 1994, since then, the government started the so-called “low intensity war” (LIW) that persists even nowadays. This process is illustrated by direct military and paramilitary hostilities against the self-declared ZACs through road cuts, crop damages, eviction of communities, military appropriation of schools and hospitals, killings, tortures, rapes, looting, and other human rights violations (Luevano, Lombera and Reygadas, 1995; Rebón, 2001; Hidalgo Dominguez, 2006). At the same time, the LIW has been deployed through more indirect ways, such as higher amounts of governmental social resources directed at the most deprived communities in Chiapas in order to capture potential Zapatista followers (Castro and Ledesma, 2000). Even though several scholars have closely followed this topic, there is only a small amount of data about the quantitative consequences of the conflict from credible sources. According to PNUD et al. (2012), the LIW generated between 50,000 and 90,000 IDPs from 1994 to 1998, the highest intensity period. Though having faced a difficult time when they came back to their looted communities of origin, the Zapatistas started to experience progressive improvements in their social conditions, not only as a consequence of the Presidency change in 2000, but also after the implementation of their new set of institutions in 2003 (PNUD et al. 2012; Hidalgo Dominguez, 2006). The Zapatistas are a heterogeneous group with respect to ethnicity, culture, tradition, and language –Tzotzil, Tzeltal, Chol, Mam, Zoque, and Tojobal (Gossen, 1996; Obregón, 1997). The same occurs with religion. As a result of the clear influence of the Liberation Theology over the indigenous communities, the federal government began to favor Protestant Churches, and consequently, a great amount of indigenous people (even Zapatistas) changed from Catholicism to Protestantism (Obregón, 1997). The Zapatistas are located in Chiapas (Figure 1), the most deprived state of Mexico. Even though there is no official delimited area for the ZACs, the Zapatistas are situated in almost half of the State (right side of Figure 2) according to CIEPAC (2003) . The difficulty in identifying the ZAC location stems from the facts that: i) the Zapatistas hide from the government due to the LIW; ii) not all members of a given community are necessarily EZLN supporters; and iii) they change their location year by year (Stalher-Sholk, 2007). Thus, at least in the first specifications, the main unit of study in this paper are the communities in conflict, who are generally ZACs, but they are not necessarily perfectly juxtaposed. As regards their institutional arrangement, the Zapatistas have developed a new platform of institutions, which is in line with the theoretical and empirical literature on rebel governance (Arjona et al., 2015). On December 19, 1994, they self-declared 32 autonomous territories (which they called MAREZ, or Zapatista Autonomous Municipalities) covering, in whole or in part, 38 official municipalities from Chiapas, out of 112 in 1990 (PNUD et al., 2012). During the first years after the Zapatista uprising, their institutions were basically the so-called Aguascalientes, the political and cultural centers created in 1994, together with some incipient health centers and schools built in the late nineties. But it was not before 2003, that they have actually established a definitive set of institutional arrangements through the creation of the Caracoles and the JBGs. Since then, the number of MAREZ declined to 27 (CIEPAC, 2003). In the Caracoles, the heart of the Zapatista autonomy, schools and health centers are generally established. The same happens with the JBGs, a rotating system of representatives where decision-making pertaining the Zapatista movement takes place (Stahler-Sholk, 2007; Guiotto and Pascual, 2008). The legislative, judicial, and executive powers are centered in the JBGs where several laws have been enacted. In particular, the Agrarian Law regulated the Agrarian Reform de facto that the Zapatistas carried out in Chiapas. At the same time, the Revolutionary Law on Women represents another important mandate of the movement. This law, together with the EZLN’s Indigenous Revolutionary Clandestine Committee demands of March 1994, attempts to empower the Zapatista indigenous women, stating for example, that they have the right to education, health, community participation, and family planning (access to contraceptives and the right to decide the number of children they have and care for). Source: Own elaboration based on CIEPAC (2003). Note: Black stars indicate the approximate location of the five Caracoles. The education system is one of the key features of the ZACs in a sense that it protects indigenous culture, values, languages, rights, sexual equality, and autonomy (Shenker, 2011; Barmeyer, 2009), thus fostering well-being improvements in previously extremely deprived and uneducated communities. In the Zapatista primary and secondary schools, there are no formal teachers; instead, local education promoters are trained in an attempt to provide an inclusive education, imparted in the indigenous community language where Spanish is only taught as a second language (Shenker, 2011). The Zapatista health system represents another vital institution of the ZACs, considering the deprived health conditions of the area, where governmental services are scarce or even inexistent (Cerda García, 2011). Its services are provided by health promoters, who had started organizing since the late 1970s, under the Liberation Theology movement, much before the 1994 uprising. Unlike the Zapatista education frame, the access to the Zapatista health centers is open to everyone, where Zapatistas attend for free and non-Zapatistas pay only a small amount of money (Cuevas, 2007; Ghiotto and Pascual, 2008). In addition to general health promoters, there are reproductive health promoters who offer health care services, sexual and reproductive health classes, and contraceptive supplies. These promoters also give birth assistance with community midwives. About preventive actions, there is a high level of vaccination compliance, together with communitarian sanitation campaigns (Cuevas, 2007; Lang, 2015; Sánchez-Pérez et al., 2006; Bellinghausen, 2009; Williams, 2012). Cerda García (2011) provides a case study of health practices in the Zapatista autonomous municipality of Vicente Guerrero. By 2003, their strategies were comprised by: i) deworming children and adults twice per year with plant-based medicines; ii) fostering well-nutrition practices; and iii) training on how to prepare and conduct papanicolau studies on women. The author also emphasises the existence of both primary care centers in some ZACs and a health clinic in the Caracol. Finally, he states that health policies directed at children were mainly focused on mortality prevention due to respiratory, gastrointestinal, nutritional, and neo-natal diseases, while those directed at reproductive-age women were focused mainly on mortality due to delivery complications and timely detection of cervical and uterine cancer. This overview about the Zapatista institutions suggests beneficial effects on their communities at the micro level (isolated qualitative case studies), while quantitative evidence is scarce due to data unavailability. In the following sections, this paper makes an attempt to broaden the horizons of the analysis around this topic at the macro level (i.e. for the whole state of Chiapas). Because of the non-random nature of the civil strife, the composition of the communities in conflict may differ from the non-conflict communities’, either by observables or unobservables, thereby the impact of the conflict may be affected by selection bias. In other words, individuals normally move from high to low intensity areas, so their ability to cope with the conflict may determine their self-selection into one or the other group. This process may end up with communities with less ability -e.g. less aggregated entrepreneurial skills, which is generally unobservable-, that in turn, determines higher probability of being in conflict and lower levels of wellbeing. This problem of omitted variable is called endogeneity (Wooldridge, 2002). In a fixed effects model with panel data, unobserved factors are wiped out assuming they are only time-invariant, so the problem of endogeneity would be solved. However, considering the cross-section nature that this study faces, it needs a different strategy; i.e. an instrumental variable (IV), which, at the same time, allows to infer causality from conflict to socio-economic outcomes. This paper uses an instrumental variable strategy based on the main referent of the anthropological history of Chiapas, Jan De Vos, who points out a strategic military spot that the EZLN Army fixed for its uprising in 1994 (De Vos, 2002). 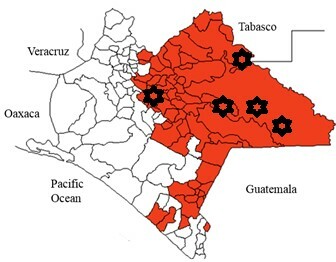 The EZLN attempted to control a geographic triangle (Figure 3) formed by the localities of Ocosingo, Oxchuc, San Cristóbal de las Casas, Huixtán, Chanal, Las Margaritas, and Altamirano, locking the roads that connect each other. The purpose of this strategy was to set a regional control at the doorsteps of the Lacandon Jungle, which can be considered as an exogenous natural boundary where the Zapatistas might have had more chances to hide from the National Army. The decision about this strategic point is related to military objectives, rather than the social or economic conditions of the communities involved in the conflict (De Vos, 2002). In particular, the IV used in this paper, obtained by geo-referenced data from INEGI, is the distance in kilometers from each locality centroid to the center of the triangle. This IV is apparently correlated with conflict and directly uncorrelated with the unobserved variables that determine the response variables, presumably complying with the exclusion restriction. 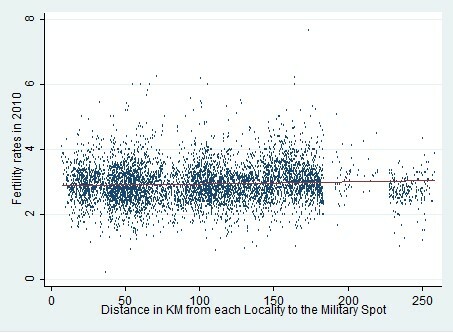 In particular, Figure 4 shows that the distance in kilometers from each locality to the triangle center is barely correlated with fertility rates in 2010. Source: Own elaboration based on De Vos (2002). Though the exclusion restriction cannot be formally tested since the model is exactly identified, it is important to examine whether the IV would have a direct and independent impact on the response variable through the error term. For example, the distance from the triangle centroid may be a proxy for vulnerability levels, in the sense that communities closer to the Lacandon Jungle may be poorer. In other words, the IV might be associated with pre-conflict socio-economic conditions, which in turn, may be determining the response variables. Therefore, this model includes baseline socio-economic controls, such as the poverty rate in 1990 at the municipal level and illiteracy rates in 1990 at the locality level, to avoid non-compliance of the exclusion restriction. In any case, when all the covariates were run on the distance in kilometers to the Lacandon Jungle, the baseline socio-economic indicators (i.e. poverty and illiteracy rates) were found to be insignificant. These results can be provided under request. Note: The red line is estimated by OLS. Another way the exclusion restriction may be violated may arise by the LIW argument, which may be reflected through higher amounts of governmental resources to communities closer to the Jungle that tend to be in conflict, as suggested by several scholars. This potential bias is mitigated by the inclusion of the public spending per capita net increase from 1994 to 2010. It should be noted that this data is only published at the municipal level, so this investigation is able to include them in only those specifications without municipality fixed effects, thus avoiding a bogus identification. In the more robust specifications, the municipality fixed effects control for every heterogeneity at the level of the municipios, thus any remaining bias would only stem from variations at the local level. Unfortunately, data unavailability precludes me to control for this potential bias in the public spending variable at the locality level. Finally, it is important to mention that other IVs related to historical processes and ethnic struggles were examined. However, as it is described in detail in De Vos (1980, 1988, 2002), several flows of migration took place in Chiapas throughout its history (especially by Guatemalan inflows from 1960 on). Therefore, all these kinds of potential IVs were discarded, preventing the results from being biased by this source of endogeneity. To identify the communities in conflict, this paper uses the military and police positions established in Chiapas from 1994 to 2000, as labeled by Hidalgo Dominguez (2006). These positions are not necessarily situated in the specific communities that are attempted to control; rather, they are located in strategic points, which allow the army to set control over an influence area. Thus, this paper considers a radius of 20 kilometers around the police and military positions for identifying the communities in conflict. For increasing the robustness of these results, this research will present more estimations at different thresholds (i.e. 10, 15, 25, and 30 kilometers), with the presumption that the effect would progressively decline as long as the threshold increases. Figure 5 presents the 246 military and police positions from 1994 to 2000 deployed in Chiapas, together with their influence areas. It is crucial for this research to point out the high degree of overlapping of this illustration with Figure 2, reflecting the fact that the major part of the ZACs is in the conflict zone. Source: Elaborated with ArcGis 9.3.3., based on Hidalgo Dominguez (2006). One reason to be careful about conflict identification is that some police and military positions might have been established for other military purposes in Chiapas (e.g. drug-trafficking). However, this source of noise is minimised, since there was no other sizeable civil struggle in that period, while drug-trafficking has just started to increase considerably in the past few years. Another situation to consider is the importance of paramilitary forces. They tended to work side-by-side with the Army in Chiapas, since they were prone to materialise what it was not politically correct for the national army (Castro and Ledesma, 2000). For example, when describing the Acteal Massacre of 1997, Hidalgo Dominguez (2006, 45) sustains: “While the paramilitaries were perpetuating a massacre, the Army and the Public Security Police were waiting 300 meters aside without any intervention”. Therefore, during the conflict period under analysis (1994-2000), paramilitary and military forces were highly juxtaposed, so the effect of the conflict would not be significantly underestimated. In particular, conflict is measured by the number of years –between 1994 and 2000- that a locality belongs to the influence area of a military or police position. Figures 6.a. and 6.b. show that conflict is negatively correlated with the distance in kilometers from each locality to the triangle centroid and it is almost uncorrelated with fertility rates in 2010, respectively. It is the purpose of this study to disentangle if this last relationship between conflict and fertility rates (and other response variables) keeps, or if it turns significant, after performing the identification strategy described in the subsequent sub-section. where δ is a constant, γ m are municipality fixed effects, DISTδ1cm is the distance in kilometers from each community (centroid) c of municipality m to the center of the strategic military triangle, Xcmδ2 are the same controls used in the second stage and μcm is the robust disturbance term clustered at the municipality level. Hidalgo Dominguez (2006) presents an invaluable and unique source of documentation of the civil conflict in Chiapas. In particular, he published the military and police spots established in Chiapas, at the locality level, as a consequence of the conflict during the period 1994-2006. I use data until 2000, since by then, it started to decrease in intensity and there were several position retirements, as suggested by Hidalgo Dominguez (2006). Socio-economic conditions at the locality level are obtained from the Mexican Population Census of 1990, 2000, and 2010. This information is provided by INEGI in the subsection “ITER”. I supplement this information with indicators from CONEVAL. I include altitude, longitude, and latitude in order to control for agricultural productivity, climatic shocks, and strategic military areas. In addition, I create the proportion of indigenous population in 1990 as the percentage of individuals older than five years old who speak an indigenous language and do not “use” Spanish (as defined by INEGI). Another variable that may have an influence on the model is the percentage of Catholics, taking into account the role played by the Liberation Theology and the governmental policy favoring protestant churches afterwards. I use this variable from 2000, since it was the first year to be released by INEGI. Additionally, a very important covariate, as a baseline socio-economic indicator, is the proportion of illiterate people older than 15 years old in 1990. Finally, I add the proportion of men in 1990, taking into account the theoretically higher mortality rate of men during conflict. I also incorporate two variables at the municipal level, which are not published at lower levels of aggregation. I obtain the poverty rate in 1990 from CONEVAL. In addition, I create a municipality public spending per capita growth variable, from 1994 to 2010, calculated in 1994 prices and taken from SIMBAD, INEGI. Finally, I use the Vincenty STATA Module (from Nichols, 2003) for: i) establishing the influence areas from each military and police position; and ii) determining the distances in kilometers of the instrumental variable. Table 1 presents the summary statistics of the data; i.e. the conflict intensity variable, the response variables, baseline controls, and the IV, disaggregated by the conflict threshold. The purpose of this division is to offer a clear picture of some disparities between high and low conflict intensity regions. However, the non-dichotomous conflict intensity variable utilised in the subsequent sections provide much richer information about the data structure of the conflict process. In particular, the conflict region in Table 1 encompasses those localities situated within the influence area of 20 kilometers from a military or police spot, while those out of that boundary are considered as pertaining to the non-conflict region. This table, first, shows that the communities have, on average, a 4.72 years in conflict, with a reminder that it ranges from zero (no conflict) to seven years (1994 to 2000). Additionally, it shows that almost all the variables, except for population (both in 1990 and 2010) and school absenteeism, are statistically different in conflict communities compared to the non-conflict ones. Fertility rate (i.e. the number of children born alive over women in reproductive age) has an average of 2.94 in the total sample, 2.95 in the conflict region, and 2.90 in the non-conflict area. The percentage of literate people aged 8-14 in 2010 (thus affected all their lives by the conflict) is 87 percent for the whole population, and it is significantly smaller in the communities in conflict. The last dependent variable, school absenteeism of people aged 6-14 in 2010, is not significantly different by conflict areas (11 percent in every case). As regards the control variables, the conflict region presents a non-significant lower level of population in 1990 and a significant higher altitude. This is coherent with the idea that the Zapatistas may find refuge not only in the jungle but also in small communities over the mountains. Simultaneously, there is less population in the conflict region in 2010 with respect to the non-conflict region in the same year, but the difference between regions reduces from 222 in 1990 to 166 in 2010 and it is still insignificant. Source: Author’s elaboration based on Hidalgo Dominguez (2006), INEGI (1990, 2000, 2010) and CONEVAL (1990). Table 1 also shows a marginal but significant difference between the percentage of men in non-conflict areas (52 percent) and conflict areas (51 percent), as it can be expected. As regards the ratio of indigenous population in 1990, it has an average of 18 percent in the conflict region, compared with only 1 percent in the non-conflict region, and 14 percent in the total area. This result is line with the perception of the Zapatistas as being part of an indigenous movement. As expected, the proportion of illiterate people in 1990 in the conflict region (41 percent) is considerably and statistically higher than in the non-conflict one (27 percent), while the overall average arises to 38 percent, reflecting the deep educational concerns in Chiapas. Somewhat surprisingly, the percentage of Catholics is a 9 percentage points higher in the non-conflict region, as opposed to the Liberation Theology argument. The municipal public spending per capita net increase is significantly greater in the conflict area, in accordance with the LIW. The last control variable included in the model is the poverty rate in 1990, which continues to portray the more vulnerable pre-conflict conditions in the communities under civil strife; i.e. the poverty rate in the conflict area arises to 56 percent, almost 11 percentage points higher than in the non-conflict area. Finally, the distance from each locality to the center of the military triangle set by the EZLN (the IV) is considerably and statistically higher (almost doubled) in the non-conflict communities compared to the conflict ones, as it was suggested. 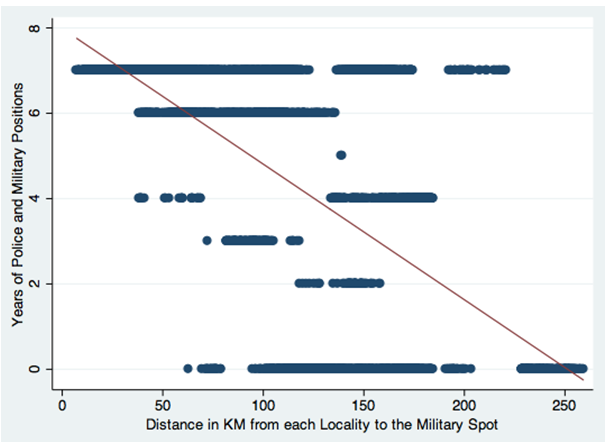 The distance in kilometers from each locality to the center of the strategic military point is a strong predictor of conflict (Table 2), robust to different specifications. The IV and the geographic variables are the only strongly associated variables with conflict throughout the different specifications. Note: All estimations include robust standard errors (in parentheses) clustered at the municipality level. Column 1 includes the control variables at the locality and the municipality level, thereby the municipality fixed effects disappear. Though this specification is less preferable than the others -since it does not control for every municipal heterogeneity-, it is added in order to visualise whether there is a particular effect of the LIW. In fact, this estimation has not found a significant effect of the LIW through public spending, but the IV is still significant. Column 2, which includes municipal fixed effects, does not show substantial differences with respect to the prior column; mainly, the IV is still significant and larger in magnitude. Column 3 adds and important covariate (though endogenous): Catholics ratio in 2000. The results keep significantly similar. Hence, Table 2 suggests that this IV is a strong predictor of conflict throughout the different specifications (with t-statistics between 4 and 5), implying that the shorter the distance from the triangle centroid, the higher conflict intensity. At the same time, the distance from the triangle is not a weak instrument, as suggested by the F-Tests, which are considerably larger than 10 (the famous “Rule of Thumb”). 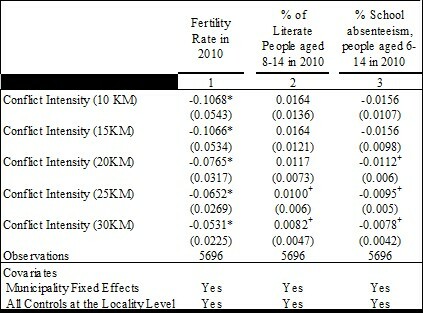 Table 3, columns 1 and 2, presents the impact of conflict on fertility rates. The first column includes both the locality and municipality controls, and thus excludes the municipality fixed effects; whereas the second column, the preferred one, includes every control at the locality level and municipality fixed effects. Although the literature review suggests neutral impact of conflict on the long-term fertility rate, columns 1 and 2 show that the Zapatista conflict is associated with lower levels of long-term fertility rates. Column 1 illustrates that an additional year in conflict is associated with a decrease in fertility rates by 0.18 children born alive per women, at the 99 confidence level. Column 2, the preferred estimation, suggests that an extra year in conflict is related to a decrease in 0.077 at the 95 percent confidence level, equivalent to a 2.61 percent drop from the conflict region average (0.077/2.95). As regards the control variables, geographical covariates are significant, as well as population in 1990 (only column 2), presumably suggesting that the isolated communities, especially those in the mountains, tend to present higher levels of fertility rates, which can be associated with higher vulnerability levels. Pre-conflict male population, illiteracy, and poverty rates are statistically and positively associated with fertility rates, whereas the sign of the indigenous ratio in 1990 is, somewhat unexpectedly, negative. The impact of conflict on literacy rates is described in columns 3 and 4. In the first case, conflict is associated with lower levels of literacy rates in 2010, whereas in the preferred estimation (column 4) the coefficient turns positive but insignificant. Altitude (column 4) and latitude (column 3) are significant, as well the indigenous ratio and the proportion of illiterate people in 1990. Finally, columns 5 and 6 describe the effect of conflict on school absenteeism in 2010. In both columns, the association is negative, though it is only significant in the preferred specification (column 6), thus an additional year in conflict is associated with a decrease in 1.12 percentage points of school absenteeism, equivalent to 9.89 percent drop from the conflict region average (0.0112/0.1132). The proportion of illiterate people in 1990 and the catholic ratio in 2000 are the only covariates significantly associated with school absenteeism. In brief, in the preferred specifications, conflict is negatively associated with fertility rates and school absenteeism, but it is not highly associated with literacy rates. In addition, public spending growth is never significant, undermining the LIW argument. Taking into account these results, an obvious question arises: which is the specific channel behind these favorable effects of the Zapatista conflict? In the following section, some ideas are addressed in order to tackle with this question. So far, it has been shown a somewhat paradoxical result, in a sense that the Zapatista conflict is associated with better social dimensions. As a possible explanation, it can be argued that the 20-kilometer threshold is not appropriately grabbing the effects of the conflict. Hence, Table 4 provides estimations by different influence areas; i.e. 10, 15, 25 and 30 kilometers (the 20-kilometer threshold is also shown for presentation matters). This hypothesis is based on the presumption that the farther from the military and police stations, the lower the effect of the conflict. Table 4 shows the results, including only the preferred specification; i.e. including municipality fixed effects. Column 1 displays the effect on fertility rates and finds that the coefficient of interest is always negative, significant, and decreasing in intensity as long as the influence area increases (from -0.1068 to -0.0531); i.e. an additional year in conflict is significantly associated with a decline in the fertility rate from 1.8 to 3.62 percent coming from the mean in the conflict region. Column 2 shows the positive association between conflict and literacy rates of children aged 8 to 14 in 2010, though the coefficient of interest is only significant (at the 90 percent confidence level) from the 25 kilometer threshold on (+0.01). An additional year in conflict is related to an increase in the literacy rate from 0.95 (30 kilometers) to 1.16 percent (25 kilometers) coming from the mean in the conflict area. Finally, column 3 suggests an impact of conflict on school absenteeism when the influence area is considered from 20 (-0.0112) to 30 kilometers (-0.0078), at the 90 percent confidence level. In particular, one more year in conflict is associated with a decrease in school absenteeism of people aged 6 to 14 in 2010 from 6.89 (30 kilometers) to 9.89 (20 kilometers) percent coming from the mean. Note: All estimations include robust standard errors (in parentheses) clustered at the municipality level. Controls and the instrumental variable are the same to those of the preceding tables when municipality fixed effects were added. This table reveals that the impact of the conflict seems not to be driven by the decision of considering as localities in conflict those situated within an influence area of 20 kilometers from the military and police spots. In fact, this is in line with the presumption that the effect shrinks when farther localities are considered as in conflict. Thus, if the measure of conflict is not presumably distorting the effects, other hypothesis will be addressed as follows. One plausible channel behind the “hidden effects” of the conflict may stem from the performance of the Zapatista institutions, which might have been positively affecting the social conditions of their communities, as it was previously exposed. Considering that the conflict and the ZACs are highly juxtaposed (as it was mentioned by comparing Figure 2 and 5), the effect of the Zapatista institutions might be surpassing (or at least counterbalancing) the negative effects of the conflict per se. Specifically, the effect of the Zapatista schools, primary care centers, health clinics, and government councils, together with their laws, may be generating improvements in the majority of communities in conflict, as several scholars have been suggesting (Stahler-Sholk, 2007; Shenker, 2011; Barmeyer, 2009; Ghiotto and Pascual, 2008; Cerda García, 2011). From another point of view, the beneficial effects might be driven by the LIW through higher public spending flows in the conflict area. However, as shown in Table 3, it does not seem likely to happen. In order to get deeper into this debate, I identify from CIEPAC (2003) and Castro Soto (2003) the official municipalities in Chiapas with Zapatista presence. In order to do so, I create a dummy variable equal to one if there were Zapatista autonomous municipalities (MAREZ) within the official municipios during the conflict (the self-declared MAREZ cover, in whole or in part, 38 official municipios). This variable is only an approximation of the potential impact of the Zapatistas, since it presents some limitations: i) it is measured at the municipal level; and ii) it does not differentiate among different degrees of Zapatista influence. This dummy variable is interacted with the conflict intensity measure (years in conflict of the locality, identified by the 20 kilometers threshold), in order to find out if there is a marginal effect of conflict when there is Zapatista presence. 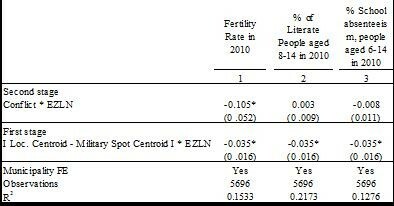 Table 5 (column 1) shows that the interaction between years in conflict and Zapatista presence is a strong predictor of fertility rates in 2010 at the 95% of confidence level; i.e. it is associated with a decline in 0.105 in the number of children born alive per women in reproductive age, equivalent to -3.56% coming from the fertility rate average in the conflict region. As illustrated in columns 2 and 3, there is no significant associations between this interacted variable and education dimensions (literate people and school absenteeism). 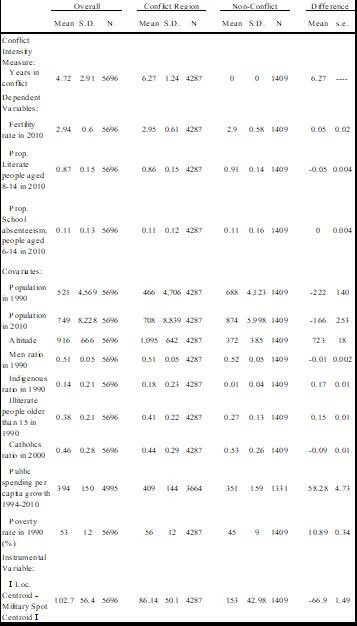 The results of this table suggest that the impact of conflict on fertility rates may be channeled by the Zapatista health institutions, as some scholars have argued. Nevertheless, the Zapatista education system may not have been positively affecting its population, at least by the available education variables. 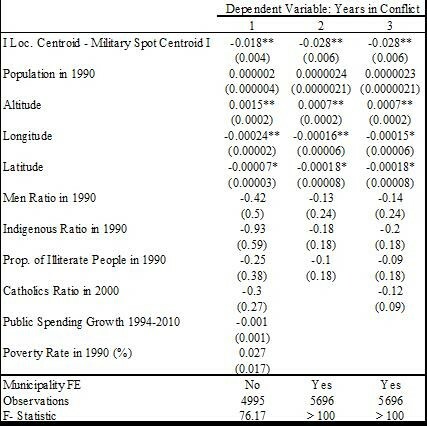 As an additional robustness check, Table 6 shows that the interaction between years in conflict and Zapatista presence is insignificant in predicting household measures associated with government provision: i) lack of health services provision; ii) lack of piped water; iii) lack of sewer system; and iv) lack of electricity. These results support the hypothesis that the favorable effect of the conflict may not be coming from the LIW argument. Note: All estimations include robust standard errors (in parentheses) clustered at the municipality level. Controls are the same to those of the preceding tables when municipality fixed effects were added. The same instrumental variable and conflict intensity measure of the previous tables are interacted with the dummy variable equal to 1 if there were Zapatista presence in the municipio. In sum, this section provides some evidence aligned with the hypothesis that the hidden beneficial effects of the conflict are coming from the Zapatista health system, specifically, on fertility rates. However, more research should be done on the reason behind the beneficial effect of the conflict on educational outcomes. It can be argued that the favorable effect of the conflict may only be echoing an economic rebound. Though it can be playing a particular role on macroeconomic outcomes, this argument is not highly plausible when analyzing human development dimensions. In particular, this is not consistent with the literate review of conflict, which generally shows detrimental effects on well-being conditions. Second, linked with the idea of the beneficial effects coming from the Zapatista institutions, it could be claimed that it only stems from the fact that the Zapatistas were receiving a large amount of donations from national and international funds. It is undeniable this source of funding. However, if it were the real reason, it may be reflecting that the Zapatistas have appropriately employed this money for subsequent development through the creation of new institutions and policies. In any case, this information, unfortunately, is unavailable. Finally, a particular concern is related to migration. If it were random, the large amount of IDPs would not impact the estimates. However, this is unlikely to happen. This fact represents a potential selection bias in this area of research (not only in this paper), which is difficult to address due to data unavailability. Although INEGI and PNUD et al. (2012) offer some general figures of migration and the number of IDPs for some municipios, respectively, this is not enough data for disentangling, in a microeconometric strategy, its marginal effect. In sum, taking into account the information restriction that this investigation faces, this paper provides some evidence suggesting favorable effects of the Zapatista conflict on fertility rates, presumably channeled by the Zapatista health institutions. In any case, future research is needed to provide more evidence regarding the Zapatista conflict impact. This paper finds a beneficial impact of the Zapatista conflict on several social outcomes. In particular, the conflict is associated with lower levels of fertility rates and better educational results. Since the location of the conflict and the ZACs are highly overlapped, these results may imply a plausible higher long-term positive effect of the Zapatista institutions on social dimensions, than the negative consequences of the conflict per se after the formation of the well-established Zapatista institutions in 2003. In order to provide more evidence about this hypothesis, the conflict intensity variable is interacted with a dummy variable indicating Zapatista presence at the municipality level. This interacted variable is strongly associated with a decline in fertility rates by 3.56%, but it is insignificant in explaining the educational outcomes. These results may be apparently capturing beneficial effects of the Revolutionary Law on Women, together with the health and reproductive practices implemented by the Zapatistas, which empowered women on their right for family planning. Nevertheless, the Zapatista schools, together with their educational framework, are not ostensibly generating beneficial effects on children educational dimensions. These results are robust to: i) different definitions of conflict intensity; ii) a great amount of pre-conflict controls; and iii) different influence areas for considering the localities in conflict. 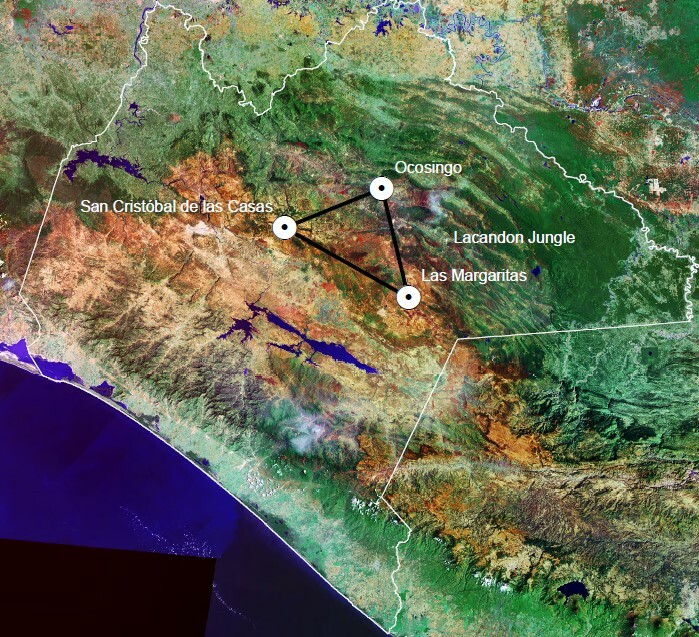 At the same time, this study addresses the endogeneity of conflict, by instrumenting it by the distance of each locality from a geographic triangle set by the Zapatistas for its uprising in 1994, at the doorsteps of the Lacandon Jungle. In brief, this is the first attempt to robustly analyze the quantitative effect of the Zapatista conflict. At the same time, it adds to the literature of conflict with a particular case where bottom-up policies are deployed in the region in conflict. Considering the data constraints that this evaluation deals with, this paper provides some evidence suggesting beneficial effects of the conflict on fertility rates, presumably channeled by the Zapatista institutions. More importantly, this paper reopens the debate around the Zapatista conflict and the plausible impact of bottom-up organizations on social outcomes. Agadjanian, V. and Prata, N. 2002. War, Peace, and Fertility in Angola. Demography 39(2): 215-231. Akbulut-Yuksel, M. 2009. Children of War: The Long-Run Effects of Large-Scale Physical Destruction and Warfare on Children. IZA Discussion Papers 4407, Institute for the Study of Labor (IZA). Akresh, R., Bundervoet T., and Verwimp P. 2009. Health and Civil War in Rural Burundi. Journal of Human Resources, University of Wisconsin Press, vol. 44(2). Akresh, R., Bhalotra, S., Leone, M., and Osili, U. 2011. War and Stature: Growing Up During the Nigerian Civil War. IZA Discussion Papers 6194, Institute for the Study of Labor (IZA). Akresh, R., Lucchetti, L., and Thirumurthy, H. 2012. Wars and child health: Evidence from the Eritrean–Ethiopian conflict. Journal of Development Economics, Elsevier, vol. 99(2), 330-340. Arcand, J-L. and Wouabe, E. D. 2009. Households in a Time of War: Instrumental Variables Evidence from Angola. The Graduate Institute of Geneva and CERDI-CNRS. Arjona, A., Kasfir, N., and Mampilly, Z. 2015, Rebel Governance in Civil War, Cambridge University Press. Barmeyer, N. 2009. Developing Zapatista Autonomy: Conflict and NGO Involvement in Rebel Chiapas. University of New Mexico Press, Albuquerque. Bellinghausen, H. 2009. Avanza el zapatismo en el frente de salud. La Jornada, Ciudad de México, February 26, 2009. http://www.jornada.unam.mx/2009/02/26/politica/016n1pol (accessed January 11, 2017). Brakman, S., Garretsen, H. and Schramm, M. 2004. The Strategic Bombing of Cities in Germany in World War II and it Impact on City Growth. Journal of Economic Geography, 4(1): 1-18. Castro Soto, Gustavo. 2003. Para entender al EZLN (II/II). In Boletines de CIEPAC, Chiapas al día. San Cristóbal de las Casas, Chiapas (accessed December 10, 2011). Castro Soto, G. E. and Ledesma Arronte, E. 2000. Siempre Cerca, Siempre Lejos: Las Fuerzas Armadas en México. Global Exchange, CIEPAC and CENCOS, México. Cerda García, A. 2011. Imaginando Zapatismo. Multiculturalidad y autonomía indígena en Chiapas desde un municipio autónomo. Universidad Autónoma Metropolitana, Unidad Xochimilco, y Miguel Angel Porrúa, México. CIEPAC. 2003. Municipios Autónomos Zapatistas (2003). In Mapas Políticos, http://www.ciepac.org/mapas/politicos.php (accessed December 10, 2011). Davis D. and Weinstein. D. 2002. Bones, Bombs, and Break Points: The Geography of Economic Activity. American Economic Review, 92(5), 1269-1289. De Vos, J. 1980. La paz de dios y del rey. La conquista de la selva lacandona por los españoles, 1525-1821, Gobierno del Estado de Chiapas, Tuxtla Gutiérrez, México. ____ 1988. Oro verde. La conquista de la selva lacandona por los madereros tabasqueños, 1822-1949, FCE-CIESAS, México. ____ 2002. Una tierra para sembrar sueños. Historia reciente de la selva lacandona, 1950-2000, FCE-CIESAS, México. De Walque, D. 2006. The socio-demographic legacy of the Khmer Rouge period in Cambodia. Population Studies, 60(2):223-231. Duflo, E. 2001. Schooling and Labor Market Consequences of School Construction in Indonesia: Evidence from an unusual Policy Experiment. The American Economic Review, 91(4): 795-813. Ejército Zapatista de Liberación Nacional. 1993. Primera Declaración de la Selva Lacandona. http://palabra.ezln.org.mx/comunicados/1994/1993.htm (accessed December 10, 2011). ____. 2005. “Sexta Declaración de la Selva Lacandona.” http://enlacezapatista.ezln.org.mx/2005/11/13/sexta-declaracion-de-la-selva-lacandona/ (accessed December 10, 2011). Gáfaro, M., Ibáñez, A.M., and Justino, P. 2014. “Collective Action and Armed Group Presence in Colombia.” HiCN Working Paper 178, The Institute of Development Studies, University of Sussex. Gossen, G. H. 1996. “Maya Zapatistas Move to the Ancient Future.” American Anthropological Association, 98(3):528-538. 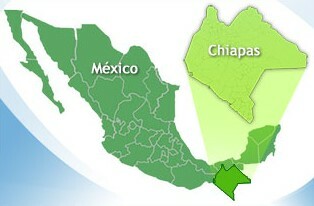 Government of Chiapas, http://www.chiapas.gob.mx/ubicacion (accessed December 10, 2011). Guiotto, L. and Pascual, R. 2008. Social movements and the project of autonomy in Latin America (Argentina, Bolivia, Brazil and Mexico). Economic and Social Research Council (ESRC) NGPA – RES 155-25-0007. Gutierrez Narváez, R. 2005. Escuela y zapatismo entre los tsotsiles: entre la asimilación y la resistencia. CIESAS, master’s dissertation. San Cristóbal de las Casas, Chiapas, México. Hidalgo Dominguez, O. 2006. Tras los Pasos de una Guerra Inconclusa (Doce Años de Militarización en Chiapas). CIEPAC A.C., San Cristóbal de las Casas, Chiapas. Ibáñez, A.M. and Moya, A. 2010. Vulnerability of Victims of Civil Conflicts: Empirical Evidence for the Displaced Population in Colombia. World Development, 38(4), 647-663. Kalyvas, S.N. 2006. The Logic of Violence in Civil War. Cambridge University Press, Yale University. Lang, M. 2015. México: Desde abajo todo, desde arriba nada. La autonomía zapatista en Chiapas y la Otra Campaña. In book: ¿Cómo transformar? Instituciones y cambio social en América Latina y Europa, Publisher: Fundación Rosa Luxemburg; Abya Yala. Grupo Permanente de Trabajo sobre Alternativas al Desarrollo, Editors: Miriam Lang; Belén Cevallos; Claudia López, pp.219-276. León, G. 2012. The Impact of War, Famine, and Economic Decline on Marital Fertility in Ethiopia. The Journal of Human Resources, 47(4), pp. 991-1022. Lindstrom, D.P. and Berhanu, B. 1999. The Impact of War, Famine, and Economic Decline on Marital Fertility in Ethiopia. Demography, 36(2):247-261. Luevano, A., Lombera, R. and Reygadas, R. 1995. Los afectados y desplazados por el conflicto militar en Chiapas, México. In Rebón (2001), Academia Mexicana de Derechos Humanos. Miguel, E. and Roland, G. 2011. The Long Run Impact of Bombing Vietnam. Journal of Development Economics, 96(1):1–15. Miguel, E., Satyanath, S. and Sergenti, E. 2004. Economic Shocks and Civil Conflict: An Instrumental Variables Approach. Journal of Political Economy, 112(4): 725-753. Nichols, A. 2003. VINCENTY: Stata module to calculate distances on the Earth’s surface. Statistical Software Components S456815, Boston College Department of Economics, revised 16 Feb 2007. Obregón R, M.C. 1997. La Rebelión Zapatista en Chiapas: Antecedentes, causas y desarrollo de su primera fase. Mexican Studies/ Estudios Mexicanos, 13(1):149-200. Published by The University of California Press. PNUD, UNESCO, UNODC, UNICEF. 2012. Estudio sobre los Desplazados por el Conflicto Armado en Chiapas. This work was part of the Programa Conjunto OPAS-1969, “Prevención de conflictos, desarrollo de acuerdos y construcción de la paz en comunidades”. Rebón, J. 2001. Conflicto armado y desplazamiento de población. Chiapas 1994-1998. FLACSO, Miguel Angel Porrúa. México. Rosenzweig M.R. and Wolpin, K.I. 1986. Evaluating the Effects of Optimally Distributed Public Programs: Child Health and Family Planning Interventions. The American Economic Review, 76 (3): 470-482. ____ and ____. 1988. Migration selectivity and the effects of public programs. Journal of Public Economics, Elsevier, 37(3): 265-289. Sánchez-Pérez, H. J., Arana-Cedeño M. y Yamin A. 2006. Pueblos Excluidos, Comunidades Erosionadas: La Situación del Derecho a la Salud en Chiapas, México. Physicians for Human Rights, Centro de Capacitación en Ecología y Salud para Campesinos, ECOSUR, México. Schindler K. and Brück, T. 2011. The Effects of Conflict on Fertility in Rwanda, HiCN Working Paper 102, The Institute of Development Studies, University of Sussex. Shemyakina, O. 2011. The effect of armed conflict on accumulation of schooling: Results from Tajikistan. Journal of Development Economics, 95(2):186-200. Shenker, S.D. 2011. Towards a world in which many worlds fit? Zapatista autonomous education as an alternative means of development. International Journal of Educational Development. 32(3):432-443. SIPAZ. Peace Process, War Process. http://www.sipaz.org/en/chiapas/peace-process-war-process.html (accessed November 14, 2011). Stahler-Sholk, R. 2007. Resisting Neoliberal Homogenization: The Zapatista Autonomy Movement. Latin American Perspectives, 34(2):112-124. Swee, E. L. 2009. On War and Schooling Attainment: The Case of Bosnia and Herzegovina. HiCN Working Paper 57, The Institute of Development Studies, University of Sussex. Williams, C. 2012. A revolution that makes possible the Revolution: The impact of Zapatismo on indigenous women’s access to reproductive health services in Chiapas, Mexico. Thesis, Department of Global Studies, University of North Carolina. Wooldridge, J.M. 2002. Econometric Analysis of Cross-Section and Panel Data. MIT Press, Cambridge, MA. Note: All estimations include robust standard errors (in parentheses) clustered at the municipality level. Control variables are those of column 1, Table 2. Since Zapatista presence is identified at the municipality level, Municipality Fixed Effects are not added. Doctor en Desarrollo Económico por el Instituto de Graduados de Ginebra, Suiza. Although this paper argues that it is evaluating the long-term impact of the conflict, there is not a clear-cut or universal specific threshold differentiating between short, medium, and long term. In Mexico, there are 32 states (or more precisely, 31 states and Mexico City), 2,492 municipalities and 299,638 localities in 2010. Hereafter, I will mention localities and communities interchangeably. The number of children born alive divided by the amount of women in reproductive age. School absenteeism rates of people aged 6 to 14 in 2010. Literacy rates of children aged 8 to 14 in 2010. In related works, Brakman, Garretsen and Schramm (2004) and Davis and Weinstein (2002) find no long run impact of U.S. bombing on post-war outcomes; i.e. city growth in Germany and population growth in Japan, respectively. In a related research, Ibañez and Moya (2010) suggest that the long-lasting conflict in Colombia reduces the amount of assets and labor income of IDPs. They explain the short-term school enrolment rate increase as a consequence of a labor market disruption; i.e. lower wages decrease the opportunity cost for education. SIPAZ (Servicio Internacional para la Paz) is an international organization legally established in the United States and The Netherlands, and based in Chiapas. A Latin American movement born in the 70s within the Catholic Church, with a tendency towards social reform and justice. According to CONEVAL, Chiapas presents the highest poverty lines in the country in 2012, ranging from 32% to 75% (asset and food line, respectively). The average at the national level is 10% and 46%, respectively. Sánchez-Pérez, Arana-Cedeño and Yamin (2006) provide the only attempt of robustly measuring the social conditions of the ZACs. However, they admit that they have an identification bias of approximately 25 percent and a considerably small sample of pro-EZLN communities. Caracoles mean “snails”, which, according to the Zapatistas, represents the idea of horizontal and circular ways of decision-making. Currently, there are 5 Caracoles (Roberto Barrios, Oventic, Morelia, La Garrucha, and La Realidad) which together encompass 27 MAREZ (CIEPAC, 2003). These, in turn, are composed by more than 1,000 ZACs (Barmeyer, 2009). This law regulated the type of land to usurp (or “recover”) before the uprising -it should neither be communal land, ejidos, nor cooperatives (Cerda García, 2011)- and the amount of land to receive afterwards, which should be no more than one hundred hectares of “bad land” or fifty hectares of “good land”, in accordance with the Zapata’s Plan of one hundred years ago. The dependent variables analyzed in this paper are not observed for both 1990 and 2010. Otherwise, a difference-in-difference strategy could be explored. This procedure does not imply that the reverse causality does not exist. Nonetheless, the identification strategy followed in this paper precludes me to provide conclusions about the causality from economic conditions to conflict. This IV implies that the initial preferences and strategies for conflict would keep geographically stable over the whole period of the civil strife, as opposed to the Kalyvas’ (2006) theory that suggests that the reason of violence should be found in the specific transition of the conflict. Though the location of the Zapatista conflict has had some variability (with especial emphasis on the north of Chiapas), the Lacandon Jungle has always represented a reference point where the Zapatistas have found refuge from the military and paramilitary forces, and thus they have located in the nearby areas. This variable is not published at the locality level. Otherwise, it could have been introduced in the model as one of the response variables, and even more, a difference-in-difference strategy could have been performed. Such as having been either benefited from public land redistribution, or located in a catholic or indigenous community, among others. The selection of this cut-off is consistent with my fieldwork carried out in Oventic (one the five Caracoles) during 2013. By comparing Figures 2 and 5, it is shown that the Zapatista’s Caracoles are overlapped with the conflict area. However, since the Caracoles cannot be precisely geo-located (they are broadly unofficially mapped), the exact distance between them and the police deployments cannot be calculated, discarding it as a potential IV. The same happens with the location of the MAREZ. In any case, I cross-checked this data with other sources (newspapers, magazines, and conflict reports) and I withdrew only twelve observations from the original database presumably being related to non-Zapatista issues. This identification is not able to shed light on the ex-post effect of conflict on the consolidation of local organizations and collective action, as suggested by Gáfaro et al. (2014). As a robustness check, in the following estimations, the definition of the “indigenous ratio” was replaced by the “percentage of people older than five years old that speak an indigenous language”, without finding significant changes in the coefficient of interest. Since the proportion of Catholics is obtained for 2000, this variable is endogenous as can be affected by conflict. Therefore, all the estimations of the paper have been re-estimated without including this covariate, but the results have not significantly changed. De Walque (2006) stresses that men mortality increases during conflict times, with a direct consequent effect on fertility rates. In particular, CONEVAL presents three poverty thresholds, related to food, capacities, and assets. I use the first one in the baseline estimations, but I perform robustness checks with the other ones, without finding significant changes in the results. Population in 2010 is not a covariate; it was rather included in the table for providing more information. 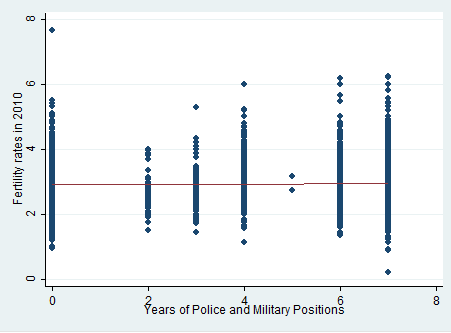 As robustness checks, the conflict intensity variable was replaced, at the locality level, by either: i) the number of military and police positions; ii) the aggregated amount of corporations (such as Public Security Police, National Army, Immigration, Judicial Police of Chiapas, Federal Police of Roads, etc); and iii) the number of influence areas affecting the locality. In these three cases, the IV was still statistically significant for all the specifications. These results can be provided under request. The construction of the IV may comprise measurement error, in the sense that I take the distance in kilometers from each locality centroid (directly obtained from INEGI final geographic data) with respect to the triangle centroid (which I calculated from the interactive map of INEGI). Thus, as a robustness check, I replace the IV by the average of the distances from each locality centroid to the three external points of the triangle. The results of this alternative IV, which can be provided under request, are statistically similar to the preceding ones. All these results are significantly similar if conflict intensity, at the locality level, is replaced by: i) the number of military and police positions; ii) the aggregated amount of corporations; and iii) the number of influence areas affecting the locality. Results can be provided under request. The municipalities identified as Zapatistas are those of figure 2, complemented by the information obtained from Castro Soto (2003). Fifty-nine municipalities have been identified with Zapatistas presence. The more suitable identification would be to test the effect of the conflict as a first step, the effect of the Zapatista institutions as a second step, and the joint effect of both as a third step. These estimations can be run with municipality fixed effects, the more appropriate identification, in the first and third step. Unfortunately, the Zapatista movement impact can be only identified at the aggregated municipality level, thus municipality fixed effects should be discarded in this specification. Therefore, the second step is not completely comparable with the other steps. In any case, the results of the second step are illustrated in the Annex, suggesting a negative effect of Zapatista presence on both fertility rates and literacy. These results are larger (this variable captures the effect for the whole period, though the conflict variable is measured per year) and still significant, compared to those of table 3, column 1 and 3.